With the new year here, there are a couple of small changes coming to our season previews for 2019. I felt like the site was a little over saturated with rankings articles, and sometimes it made stuff hard to find. So I've decided that instead of every class getting its own day, we will do two days of previews a week instead. So one day will be Class 3,4,5 and the other will be Class 1 and 2. This gives me more opportunities to write about other things, like the upcoming indoor meets, and I think gives everyone easier access to the previews. Thank you all for supporting the site in 2018, and I look forward to covering Missouri Track and Cross Country again this season! The Class 3 Girls and Boys 400m sees both State Champions return. Deayvion Smith of Trinity Catholic is the returning Girls Champion, and she'll be battling with last year's runner up Hadley Jetmore of Pembroke Hill to defend her title. Jetmore has the faster PR of the two with a 57.11 to Smith's 57.14, and I'm sure they'll battle all the way to the line again this year. The Boys race is LOADED. 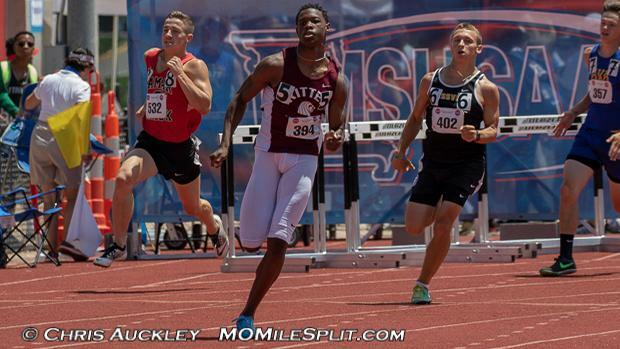 Returning Champion Jameson Williams of Cardinal Ritter returns, and holds a PR of 47.18. His greatest challenger? That would be his teammate Hasani Barr who is coming back after being injured last year who has a 47.41 PR. The third ranked 400m runner, Lee Steward, also goes to Cardinal Ritter so look out for their 4x400m team this Spring! Check out my subjective rankings for both boys and girls below!